Saturday 28th July saw a return to the one and only Maver Hayfield Lakes for the venue’s final qualifier event of the 2018 campaign. Conditions on the day looked set to complicate things with high winds combined with torrential rain affecting bait presentation, preventing the majority of the field from fishing the usual tried and tested methods that had been so prolific at the venue of late. Those that could fish the preferred methods had the wind off their backs, but the fish just weren’t in these pegs in any numbers. As a result, this latest qualifier was a relatively low weight affair by Hayfield standards. Venue regular, Paul Wright, topped a difficult qualifier at Maver Hayfield to confirm his Mega Match This debut. Due to the conditions the winner, Paul Wright (Dynamite Baits/ Halkon Hunt / Elite Hollow), decided to fish a simple match short from peg 55 on Island lake. In an bid to aid presentation, Paul opted to fish at top two plus two straight out in front of him at full depth, lifting and lowering his chosen hookbait to tempt bites. Loose feeding half a dozen 6mm pellets at a time and using a banded 6mm on the hook, he caught carp to 12lbs steadily throughout the match to finish with a total weight of 131-10-00 to qualify for the final. In second place from a somewhat more sheltered area on Adams lake was local angler, Keith Pearson (Doncaster). 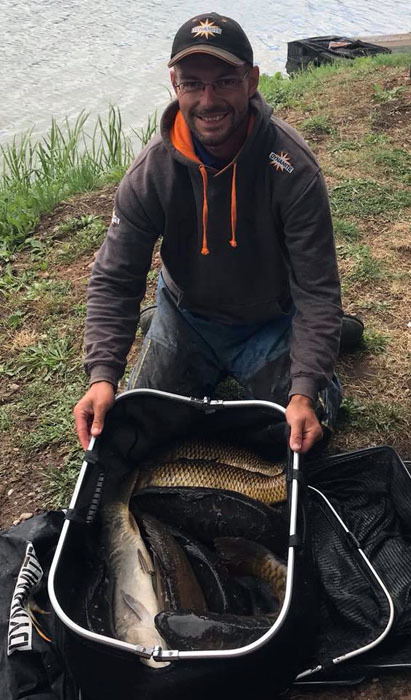 Keith drew peg 67 on Adam’s lake and opted to fish shallow at up to 14.5 metres whilst feeding four pints of 6mm pellets throughout the match to finish with a total of 101-15-00. Third place was taken by Cadence UK backed angler, Keith Easton, who drew end peg 80 on Island. Like many on Island lake, Keith was faced with horrendous winds blowing from right to left. He opted to start the match fishing a straight lead at twenty (20) yards along his left margin to pick up a few fish before switching to the pole at 6 metres down his edge to finish with 96-06-00.